New things are always scary. Psychologists say that fear of the unknown is one of the most debilitating anxieties people struggle with, and new things by definition are usually unknown. This time of year people inevitably think about changing or adopting a new habit pattern, trying something different or taking a leap of faith. These resolutions often come up in conversation and the primary obstacle that holds people back from these well intentioned, but often doomed-to-failure ideas, is fear. I have many new things coming up in my own life (including a new blog and a new book) and I’m terrified. Shaking in my boots terrified. If you’re not familiar with this brilliant and hilarious Baz Luhrmann movie, here’s a brief synopsis: Acclaimed Australian ballroom dancer, Scott Hastings has lost his partner, his motivation and his passion for dancing. However, the next Pan-Pacific dancing competition is only weeks away and his family and friends force him to search for a new partner. The tryouts are a disaster and in despair, Scott can only dance his unappreciated, strange new moves in the privacy of the closed studio. That’s when frumpy, overlooked Fran nominates herself as Scott’s new partner, much to his disbelief, and rather than scorn Scott’s new revolutionary new dance moves, adds her own Spanish pasodoble-style flair to their routine. Fancy footwork and sparks fly and Scott and Fran take the ballroom dancing world by storm and, and …. well, you just really have to watch it for yourself, so I’m not giving away the ending. A life lived in fear, is a life half lived. Half lived lives are no lives at all. Even though we’ve all heard it a thousand times, I’ll repeat it here. It’s better to take a chance and fail than to live your life wondering what would have happened if you'd tried that crazy idea. So, if you’re reading this post and have let fear keep you from doing something, go do it! No regrets! And for your motivation, watch Strictly Ballroom in all its feathery, sequined, eye-shadowed glory. *** new is an unapologetic echo word in the above post. I'll miss your posts on the Writing Bug. Kelly, but I wish you the best of luck with your new book. I love your posts, Kelly! They always motivate me. (I still remember Somebody Wanted But So Then. LOL). I'm a "Strictly Ballroom" fan, too, and my daily humor Rx is "The Big Bang Theory." (Check out the movie "Warm Bodies" for more merriment.) Best wishes for all your future endeavors, and good luck/congratulations with your new book! 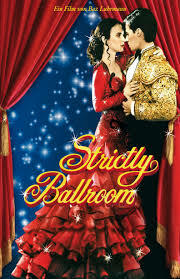 Strictly Ballroom is the bomb! I needed a reminder today about living life boldly. Congrats on moving on to a new challenge. *cringe* I've never seen the movie! But I love the message. I will miss your posts, too!